Another image by an unknown photographer. It shows Midland Red 2416 (GHA 335), a SOS SON of 1940. Apparently seen in its final days – acting as a "Trainee Vehicle" – it still exudes an air of quaint gentility in spite of it having been rebuilt in the late 1940s. (It makes an interesting comparison with the other picture of a SON of this site in its wartime condition). This view seems to show the driver under reversing supervision at an unknown location (help required please). Its sister, 2418, is preserved as part of the Wythall collection. Why is it that, every time I see one of these radiators, I think "AEC"? Maybe it’s because I’m a Londoner by birth, despite the Lancashire origins! An amusing observation, Pete, that all readers will understand. I looked at the photo, as I did at the earlier one, and wondered about the destination display. The lack of information might be explicable because the vehicle is on driver training, and the similar lack of display on the other SON might (just) be explicable in terms of wartime conditions. However, why is there no destination box at all? The roof line seems to be begging for one. What was Midland Red’s practice? Roy, did it perhaps come from the era of slipboards mounted diagonally across the bonnet? If you look at the other wartime SOS-in-service on this site, all is revealed about the destination boards (I had to look first)…. but it still looks as if they meant to have a proper box and changed their minds! Yes, Roy, this lack of destination screen has always puzzled me. None of the MR half-cabs had them but, as we can see, the body seems to have been designed for a very shallow one. All these buses used destination boards, positioned in slots more or less where the "L" plate is, even after they were rebuilt in the late 1940s. When we consider that, by this time, MR were one of the most progressive operators in the UK – we have to wonder why they retained this archaic arrangement. Not just the destination arrangement but the vehicle itself looks archaic. The last operator to buy SOS chassis from MR was Trent who took their last ones in 1940. Throughout the thirties, most of the Trent ones were antiquated looking. No doubt they were sturdy, no doubt they were economical, but when compared to their neighbours, East Midland and Barton with their impressive fleets of Leylands, I’ve always thought they must have been something of a joke. I agree with Chris that Midland Red’s in house SOS designs always looked archaic in comparison with contemporary competition, and the 1920s shape of radiator that, until 1937/38, preceded the "AEC clone" type shown above made the machines look even more ancient. The destination display matter is intriguing. By 1929, the Midland Red fleet consisted entirely of single deck vehicles, and to cope with increasing passenger loadings, the company introduced its first double deck design in 1931, subsequently producing fifty in 1932/33. This design, the DD-RE (I am given to understand that the often quoted designation REDD is erroneous) had a conventional destination display at the front between the decks, yet new single deckers continued to appear with the slip board arrangement on the bulkhead behind the engine bonnet. Someone at the top of the company must have had an intransigent attitude to persevere with this system for so long. 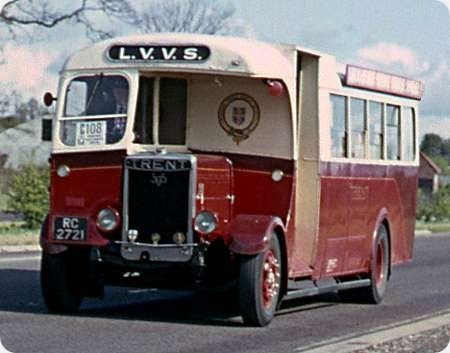 In connection with Midland Red destination boards on SON vehicles, I remember that about 1950, there used to be an open box in Leominster Bus Station in which appropriate ones were stored for use as required. Nowadays, such an arrangement would provide a ready supply of offensive weapons! Service numbers were displayed using stencils in a back-lit box in the front nearside window. Only two stencils of each figure were carried, hence there were no BMMO routes numbered 111, 222, 333 etc. BMMO were in the forefront of advertising their services – although it seems Donald Sinclair didn’t necessarily approve of O.C. Power’s tastes in such matters. So why the blinking heck didn’t they see fit to actually advertise clearly where each bus was actually going? – dark night, fog . . . stencil and wooden board?? The location is Rutland Road, Bearwood. Training Instructor Grainger is watching an obviously trustworthy trainee reverse out of the back entrance to the garage, adjacent to the training school – presumably the route through the garage was blocked. Mr Grainger took me for my driving assessment when I joined the Midland Red in 1973, which I passed with colours if not flying, then certainly flapping in the breeze! Lloyd – how good to get not only the exact location, but a name as well! Thank you. The photo has a late 1950s feel to it, so Instructor Grainger would still have at least a decade of active service left. It’s amazing to think that, presumably, he would have had to be proficient in driving these arcane specimens and the C5 motorway expresses! LLoyd, funny how a name triggers the memory (now at 78 suffering somewhat). Mr Grainger took me in Fedd BHA 453 on 13th March ’57 – I kept the record of my training from 11th-28th March 1957 – and again on my ‘pre-test accessment’ on 28th then passed me to Mr Gowan and D7 4453 (XHA 453) for the test, passed OK. Wonder if you recall any of the other instructors : Messrs Shanain, Skinner, Yardley, Callaghan, Powell, Bennett, Mynard and Birch? It was a short but happy training month as I recall. Midland Red managed without illuminated destination indicators because it was a system where each route was so well known and each stop so clearly marked that it was hard to get the wrong bus by mistake:if in doubt you simply asked the conductor! I was about 12 when the last SONs were in service and I clearly remember that the vehicle batteries could just cope with starting the engine, the interior lights went right out and often had to be switched off in order to start! I doubt if the system could have coped with more lights! Remember that visibility was not exactly a priority in those days, when only a dim red stop/tail light was provided, and this was in a partly rural area. The departure stops were carefully worked out,to the extent that certain stops on a road were used by certain services only. There was one Stop I used near my home in town, which was provided for just the one cross-town route only… other services along that road, and there were many, just ignored it! A couple of my family worked on the buses in that era and never had a problem with destination boards: you just carried the ones you needed on that shift, not a full set! Larry, sorry to disagree but the SOS radiator was on the centre line, the optical illusion is due to the half cab being really a third of the width of the vehicle. The lack of a balancing mudguard on the offside adds to the illusion. As far as the FEDDs are concerned, from memory, the same illusion existed. BMMO cabs of the period were renowned for being cramped and it has been said elsewhere that the SOS/FEDDs were not the company’s finest products. Phil, the earlier SOS types with the rectangular radiator certainly had the radiator offset to the nearside whilst keeping the starting handle on the centre line. The picture of an ON at this link illustrates the point well:- www.flickr.com/photos/8755708 Midland Red seemed to take a perverse delight in the jarring aesthetics of its pre war designs. As you state, the cab tapered sharply towards the front of the vehicle to line up with the radiator offside, and the mudguards (one could scarcely call them ‘wings’ on such an ugly duckling) were different on each side. Whatever their mechanical virtues, these machines looked awful and the tedious overall red livery just compounded the problem. Roger’s link well illustrates the early production offset radiator but my point was regarding the bulk of SOS production, including the illustration on this thread. Larry stated that the radiator was always offset and this myth is perpetuated by many enthusiasts looking at photos because the optical illusion caused by the eccentric design of the cab, dash panel and mudguards misleads the eye. Measurement of this thread’s and many other photos clearly shows that the vertical chrome strip in the centre of the radiator is at the centre of the width of the vehicle. Phil That is interesting because the starting handle aperture on the original photo at the top is not on the centre line of the radiator. Does that mean that the engine wasn’t on the centreline? Sorry Phil but I’m not convinced. If you look at the radiator position in relation to the spring dumb irons (which unarguably are symmetrical) the rad is closer to the near side spring than the offside. I have looked at Roger’s link image of the FEDD, and I traced a line down from the upper deck window centre strut, as this seemed to be fitted centrally. This links up nicely with the starting handle hole, and shows that the radiator centre strip is clearly off-set to the near side. My understanding from reading years ago was that most if not all SOS forward control vehicles had a narrow cab, but eased the driver’s position a little by having the engine (and therefore the radiator) mounted towards the nearside. Wasn’t the pre-war Dennis Lancet similarly constructed, with an engine and radiator to the nearside? To me, the centre line of the FEDD radiator agrees entirely with the pillar between the two front windows upstairs, which appears to be in the centre of the body. The cab is certainly less that half the width of the body, which rather distorts the balance of the lower deck. It looks as if the springs are not equidistant from the centre line. The only pre-war SOS buses with a centrally mounted radiator were the OLR class, which were coaches converted during the war to half-cab from full bonneted normal control, which is why the radiator was fitted centrally. Roger, Andrew and John, please measure the distances between the centre line of the radiator and the extremities of the vehicles, nearside and offside in both the photo on this thread an the FEDD photo. As for the position of the starting handle hole there are many examples of Leyland prewar single and double deckers where the starting handle hole is offset yet no-one seems to say the radiators are also off set. Phil It was because of your insistence that the rad is central that I raised the question of the engine being offset. Ford definitely offset the engine from the centreline on the 83e vans(away from the driver, they even had 2 holes as standard to allow for LH and RH drive) Morris also had an offset engine in a van of comparable size to the Ford. Phil, I concede that the starting handle isn’t centrally placed on the chassis, but I maintain that the radiator is offset to the nearside. If you check the dumb iron positions on the FEDD picture, they are definitely equidistant from the vehicle sides. It’s the radiator that’s askew. I accept the challenge and think I’ve found the perfect photo to illustrate the point. In the TPC book ‘Midland Red’ Vol 1, page 126, is a photo of full front FEDD EHA 290, the radiator’s central filler cap is clearly to the nearside of the central windscreen pillar and the accompanying text states "….showing the radiator offset to the nearside." There are a number of reasonable quality front end photos of both double and single deck models which highlight that the rad is mounted closer to the nearside front spring than the offside unit, the significance being that the springs are symmetrical to the centre line of the chassis. 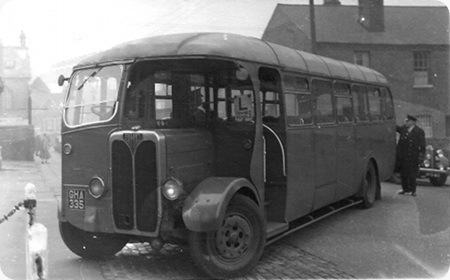 Midland Red FHA 236 (2254, formerly 236) was one of their unique pre-war, front-entrance, SOS FEDD double-deckers. They were built in large numbers between 1933 until 1939 with bodies by Carlyle (1), Short Bros, Metro-Cammell and finally Brush, each batch having gradual improvements and modifications. Like their SON single-deck sisters, they were extensively rebuilt by Hooton Aero & Engineering (and others?) in the 1940s to extend their lives. 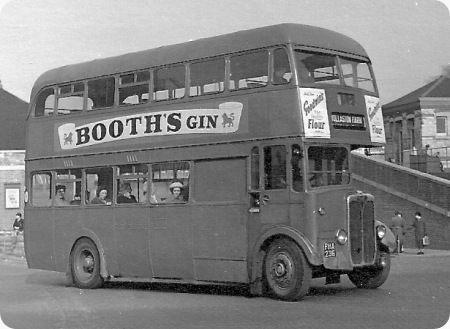 This example is seen at Stourbridge bus station, probably in the late 1950s. Note the position of the fuel cap, which fed the tank positioned beneath the driver’s seat. This postcard is uncredited so if anyone knows who took it, please let us know. It’s interesting how this forward entrance layout, used extensively pre-war by Barton and London Country area as well as Midland Red died out in the post-war period only to find popularity again in the early 1960’s. The reasons cited for the adoption of forward entrances in the sixties were greater safety by giving the driver a better view of the entrance and easing the conductor’s workload as a result particularly on 30ft long higher capacity vehicles. Looking at this, and at the single decker posted a few days ago, without looking at the caption, the radiator grille looks remarkably AEC, at first glance. Then, you study it and see it isn’t! Dare I say, that surely must be one of the most awkward looking designs imaginable. What strange proportions giving it a very "tall" appearance and the design around the cab is very unhappy. Even the radiator looks partly buried by the flat, featureless front. Thank goodness this was only a blip in inspiration before coming up with many superb designs not long afterwards! I hope this doesn’t upset anyone but beauty really is in the eye of the beholder..this poor bus needed help! You’re absolutely right, Richard, on both the points you make: first, I agree with you that the overall design just doesn’t work. The whole of the cab area is untidy; the staircase gives the impression that the front offside passenger window has just been blocked off. The ‘tall’ appearance is possibly due to the angle of the photo, but you’re right about the radiator, the location of the front registration plate exaggerates the problem, and the livery doesn’t help either. However, as you also remark, beauty is in the eye of the beholder; unlike many correspondents, I always thought the (much later, of course), Orion looked balanced and business like, (especially on M&D’s Guys), but at the time, the message I was being taught was that appearance is secondary to operational performance any way. An ugly duckling that was economical and reliable was preferable to a good looker that wasn’t. The choice of entrance location, (Philip’s comment), is worth an entire separate article of its own. For urban working, there was a lot to be said, (before H&S concerns), for open platforms – quick, convenient for passengers, and, provided the driver was using his mirrors as he should, tolerably safe. Doors were less draughty for inter-urban use, but manually operated doors, especially rear doors such as Lodekkas had, were a drag for the conductor otherwise and were usually left open. In moving to front entrances, I think some operators – e.g Southdown with its Queen Marys – were motivated partly just by a desire to demonstrate their modernity; officially, the conductor remained responsible for giving the ‘go’ bell however busy. Personally, I never understood why operators chose rear or centre entrances on underfloor single deckers intended for stage carriage work. Although it wasn’t my favourite, I agree with Roy that the Orion – in the right livery – could still look good. [M & D, Sheffield and St Helens being three examples.] …..but ideally have a good looking, attractive vehicle that is also reliable and economic – in that order. While the body, as a whole, is not unattractive, the detail is very deleterious to the overall effect. Although I’m no lover of sliding windows, the arrangement of these is bizarre. It’s also mean upstairs, in such a smoking era! The driving cab windows are so small as to be useless to a driver looking out, and the front/rear side ones are non-standard lengths! At least both headlamps are the same height! I wonder if these FHA’s had the same entrances as the earlier EHA’s, whereby the (wooden?) doors were inset and there were two steps to climb before going through said doors. I recall the latter when I was based at RAF Stafford in 1956-58. My abiding memory of BMMO at this time was the sole bus (usually a D7), which ran through the Sunday night/Monday morning from Stafford railway station the RAF Stafford. This service must have broken records for overloading, with folk standing downstairs and upstairs and sometimes three to a seat! Bends were taken very gingerly, but with no guarantee that the vehicle would right itself then! If the bus wasn’t waiting, we’d take one of the pre-war Rolls-Royce taxis which held about 7-8 and were more than capable of 70mph, even at 20+ years old and God knows how many miles on the clock! When these beauties were replaced by Vauxhall Wyverns, my last journey from camp to station involved a driver who remained in top gear for the whole journey into town, slipping the clutch with expertise when crawling through traffic – such consummate abuse! But I digress! This vehicle remained in service until 1960 and was one of the final 6 withdrawn in December 1960. Two sister FEDD’s – 2120 and 2247 – continued as staff and training buses, I wonder how many miles they covered in their lifetime? I vividly remember as a youngster going ‘long distance’ with my parents to visit a cousin in Halesowen (from my home of Birmingham) and the route traversed the infamous ‘Mucklows Hill’. This was used for testing new buses and the FEDD’s were the staple diet on this route along Hagley Road and the climb-returning to Brum-was in first gear for about a mile, I can still hear the howl of the poor K type engine to this day! The use of forward entrance double deckers in the East Midlands before World War 2 was not confined to Barton. Midland General/Mansfield District (on AEC Regents) and Trent (AEC Regents and Daimler COG5s) were users of this entrance layout for double deckers as well. Trent also had a batch of FEDDs with MCCW bodies. After the War Barton continued with forward entrance double deckers with its Leyland PD1s with Duple bodies while MGO/MDT and Trent switched to rear entrance bodies on double deckers. David, you speak as an enthusiast, and from that standpoint, your views, (appearance, reliability and economy in that order), are the appropriate ones and few enthusiasts would disagree with you. However, expressing your order of preference in M&D’s Traffic Department would have caused major head shaking; doing so in front of the Traffic Manager, Stanley Smith, would have been to risk a reaction of life-threatening proportions! Similarly, I don’t think your views would have been appreciated by the Chatham Detailer who’d had to send out a Guy Arab at ten o’clock at night to replace a broken down Atlantean – a not altogether unknown occurrence. I was going to say the same as Michael regarding East Midlands area use of front entrance double deckers. Just to add that Trent had quite a lot of their Weymann bodied front entrance vehicles rebodied with Willowbrook rear entrance open platform bodies after the war. I can also remember travelling from Alfreton to Nottingham on a front entrance Midland General Regent about 1952. They had big single piece manually operated sliding doors. Barton’s Duple PD1s however had power operated bi-parting doors – with a set of conductor or passenger operated open/close buttons on the inside, and I seem to think an external open button. Roy, speaking as an enthusiast, I was saying "Why not have something good looking". Only the reliable and economic (in that order) were meant to be juxtaposed – ideally they should be good looking as well. In common with David Oldfield Midland Red buses sadly leave me cold. They may have been innovative but their looks were not for the purist with the possible exception of the C5 motor way coaches. No give me an AEC preferably with Roe bodywork any day! How interesting to get the operator`s viewpoint in these posts. Roy`s comments about his M and D experiences of management attitudes just makes me realise that operators had a totally different approach. It was all about profit and loss, with a dash of "public service" thrown in. You have the best of both worlds, Roy, as you have enthusiasm, and a knowledge of the practical issues! Chris H., that’s music to my ears (AEC/Roe). Fascinating isn’t it how attitudes and priorities change. These days it is all about appearances, image, reputation and less about genuine customer service. Maybe years ago it really did not matter what a bus looked or rode like as long as it arrived at 11.38am on the dot. The even more strange thing is that very many operators combined good looking vehicles WITH service as it is well documented on this website. It is a rather rare find today though! I must agree with David and Chris about BMMO. All my enthusiast life, I have failed to interest myself in anything Midland Red. Something about their ugliness, narrow cabs, and "totally unlike anything elseness"
Perhaps the later examples were more pleasing to look at, but something was missing for me! It was the same when SOS buses were in other fleets such as Trent, no appeal whatsoever, and I lived on one of the BMMO routes for the last year or so of their existence too! However, if people ARE interested, who am I to criticise them. To repeat the current idiom of this site, "Beauty really is in the eyes of the beholder"
Your meaning, David, was really quite clear, and I was, perhaps, being a bit pedantic in taking you up on it. You’re absolutely right; while reliability and economy are obviously vital factors, there was, (still is), no reason why the vehicle couldn’t also be pleasing to the eye. Hence, I’d agree with you totally about AEC/Roe – a great combination that fulfilled all three requirements. My observations were just based on personal experience. Since I was supposed to be learning about bus company management, I always tried to understand, (and acquire), a ‘management’ view about the fleet rather than an ‘enthusiast’ view. Since, also, the then Traffic Manager was very well known as a man not to mince words, I couldn’t help, as I wrote my comment, getting a mental picture of his reaction, (which would have been voluble and scathing), to the idea that operational effectiveness should in any way be compromised by considerations of what he might well have described dismissively as ‘prettiness’. My operational training in the Medway Towns altered my opinion of Leyland, a maker who until then I’d almost revered, especially in comparison with Guy, a maker who I’d hardly come across and had never thought about much. Guys every time! I mentioned the Orion only because that’s what we had and they were very satisfactory in service. On balance, given a totally free hand, I’d probably have stuck with (6LW-engined) Arabs, but with the Park Royal bodies that East Kent had and which were still occasionally seen at Maidstone. Not the AEC/Roe combination that you’d have chosen, David, but if I’d been a Traffic Manager, I’d have been happy. AEC/Roe was one of my favourite combinations too, David, but not quite as nice as highbridge Bristol K/ECW! There are many other "classic" combination favourites, and it would be nice to hear what they all are. I`m quite fond of the whole range of utility bodies too, especially Daimler CWA6/Duple (shell back dome, of course) I dare not mention the famous phrase about beauty yet again! My first encounter with Midland Red buses came when, as an ATC cadet, I went on a week’s summer camp at Shawbury, near Shrewsbury, in 1957. With memories of the Picture Post "eyes" set each side of the front destination display on London buses at that time, I always thought that the curiously miserable, droopy expression of the D5 similarly deserved a teardrop on each side of the destination box. The crude radiator slots of the tin front didn’t impress me much either. The D7 was a bit less eccentric in appearance, but the set back front wheels of the D9, apparently intended to improve engine bay access, always looked a bit odd and unbalanced to me. At least the D9 and the contemporary S14 had a decently designed radiator shape instead of the primitive slots of previous types. The early FEDD buses up to about 1938 had the unbelievably old fashioned radiator inherited from the ON type, and this was set off centre to the nearside, with the nearside of the cab positioned in line with the offside of the radiator. The result looked decidedly antiquated, and compared poorly with contemporary AEC, Daimler and Leyland models. The introduction in 1939 of the "AEC" lookalike radiator, as shown in the picture of FHA 236, though still offset, did improve matters somewhat, but the curious disparity in the spacing of lower and upper deck window bays makes the body look untidy. Probably another reason why Midland Red failed to enthuse many of we transport aficionados was the boring, unrelieved, overall red bus livery, though the black embellishment of the coaches showed what could be done with a bit more imagination. John. If you mean KSW/ECW, I agree with you. The only thing that spoiled Sheffield’s 1957 B/C Fleet PD2s was the tin front. The four bay body was far better than the five bay on the K – but Lowestoft’s rare five bays on Regent IIs were rather special. PS: Roy. Glad we’ve not fallen out – and still agree!